The new secretary has worked both in government and at private-sector defense contractors. 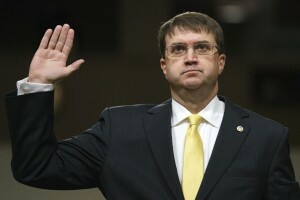 The Senate voted overwhelmingly Monday to confirm Robert Wilkie as the new secretary of the Department of Veterans Affairs. Mr. Wilkie, a Washington insider and longtime Defense Department official, was confirmed with a vote of 86-9. The new secretary, who has worked both in government and at private-sector defense contractors, takes over a department facing large-scale changes and that still has vacancies in key leadership positions. As the VA chief, Mr. Wilkie will lead a department with more than 350,000 employees and a nearly $200 billion budget. Mr. Wilkie first served as acting secretary after the ouster of President Donald Trump’s first VA secretary, David Shulkin, in March over a travel expenses scandal. Upon being nominated to the top VA post in May, Mr. Wilkie vacated the acting position for his job as an undersecretary at the Defense Department pending a confirmation hearing, leaving the department in the hands of acting secretary Peter O’Rourke. Mr. O’Rourke will likely remain at the VA, but the VA didn’t respond to a request for information on his new role. Trump Launches Revamp of Veterans’ Health Care. Can a Rudderless VA Carry It Out?